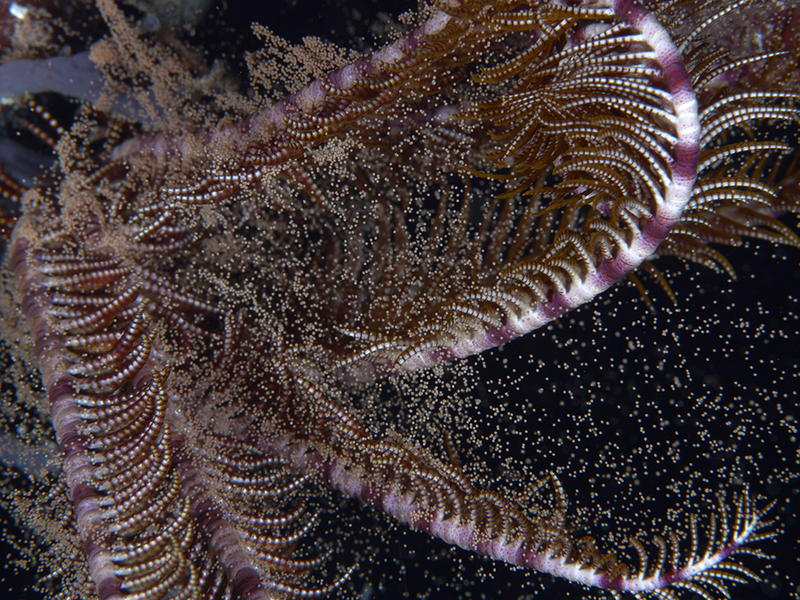 On the coral reefs, there are many challenges to reproduction and survival -from larvae to adult. Let’s explore the unique behaviors and methods marine animals have developed to meet these challenges. The first step to successful reproduction is finding a suitable mate. Usually, it’s the male who does the seeking, looking for the best female and he will try anything to attract her (sound familiar?). At dusk, dozens upon dozens of Mandarinfish at Magic Pier in Pasarwajo Bay, a Pelagian dive yacht signature dive, can be witnessed performing their beautiful courting dance. Accessed only by Pelagian, this is one of the best spots on the planet to see this brilliant display of courtship. Fecundity is what makes a female attractive. In most species, the egg-carrying capacity is directly related to the size of the female and her size to her age: the bigger the female, the better capacity she has to produce bigger and better eggs, which in turn will produce bigger larvae, more suitable for survival. And so, the males have an instinctive tendency to go after larger and older females. Once a male has located his preferred female, he may stage an elaborate display, which includes fin flashing, dancing movements, brilliant patterns and color changing. He’ll keep trying until he attracts his chosen lady into his territory. Coral reef fish are amongst the most elaborately ornamented animals on the planet. Their colors are not only just for show, and play a fundamental role in reproduction. Fishes’ distinct colors and unique markings help them identify others of their own species. Butterflyfish and wrasses are numerous and have many similar colors and patterns, so some have even evolved specific body posture or movements unique to their own species that identify them as a potential mate. A limited number of marine animals, such as some sharks and rays, are viviparous or livebearers, meaning they produce young that are fully formed and ready to live independently. Most marine creatures are oviparous or egg layers, a group that divides into three categories: pelagic spawners, egg layers and brooders. The pelagic spawners are the most common – species ranging from parrotfish to invertebrates, like the crinoid above, which release their gametes (eggs & sperm) into the water column at times of strong outgoing currents. This way, the eggs are sent seawards, where there is less chance of predation than on the reef. Often the spawning happens at dusk when there is poor light, once again to reduce predation. Some fish spawn daily, others monthly and others yearly at a very specific time. To give their eggs a better chance of survival, some fish create aggregations and produce gametes in large numbers. These impressive aggregations are known as mass spawning. Most pelagic eggs and larvae are adapted to life in the open sea by having flotation devices, body transparency, and a tendency to move towards the light, all of which serve to keep them closer to the surface and away from predators. When they hatch they often have no eyes, no pigments and no fins – these will develop during the larval stage as they metamorphose into juveniles and begin to look like fish. The egg layers attach their eggs to the substrate. Sometimes the eggs are guarded by the parents up until the day of hatching, at which time the larvae drift away. 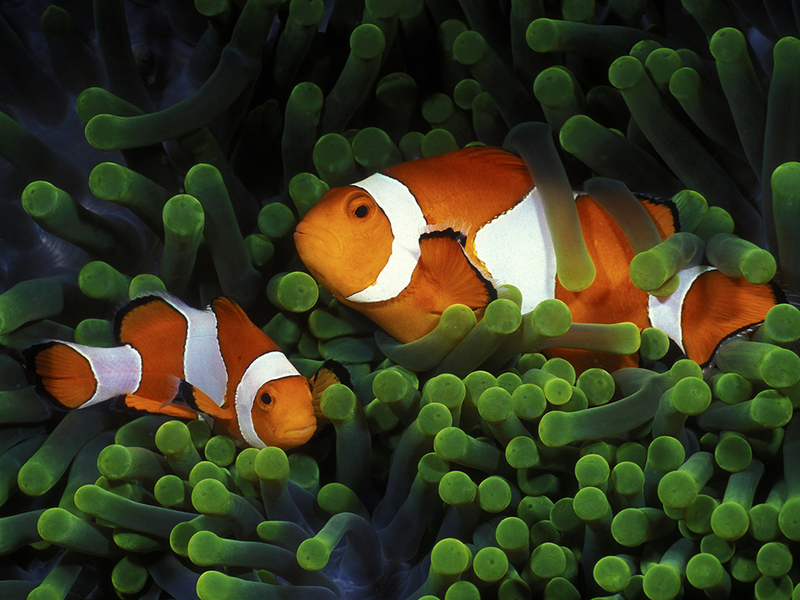 It is common to see some anemonefish, damselfish or gobies zealously guarding their eggs. However, parental care is more an exception than a general rule on the coral reef. 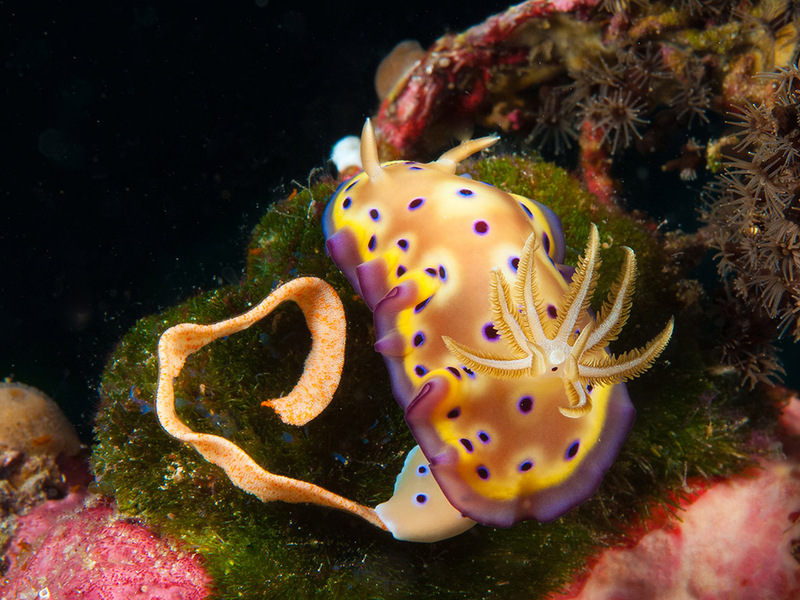 Above, a nudibranch lays eggs onto the substrate, a familiar sight on dives such as Zoo, Trailblazer, Magnifica and other popular Wakatobi sites. The brooders provide parental protection for their fertilized eggs as they develop. The male seahorse and pipefish carry their eggs in their pouch until hatching. 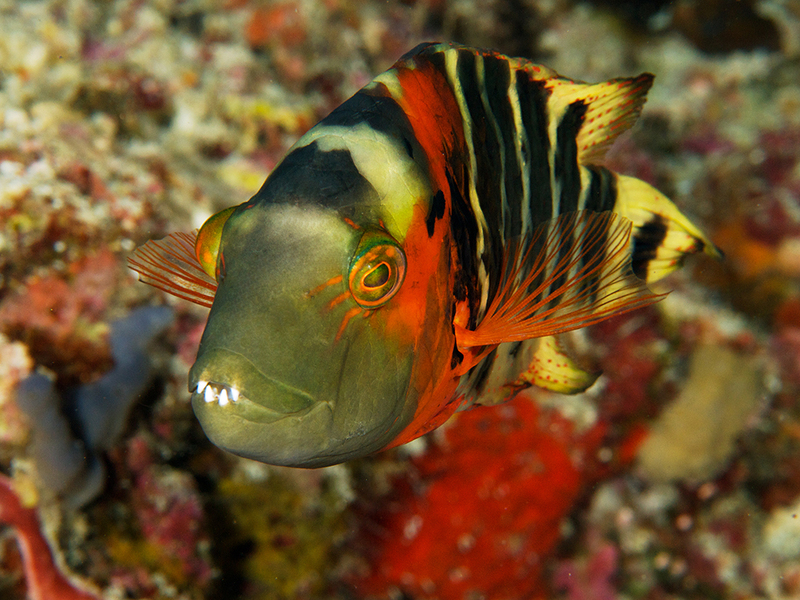 Even more impressive are the mouth brooders such as some cardinalfish and jawfish, with the male carrying and carefully caring for the delicate fertilized eggs in his mouth right up until hatching. 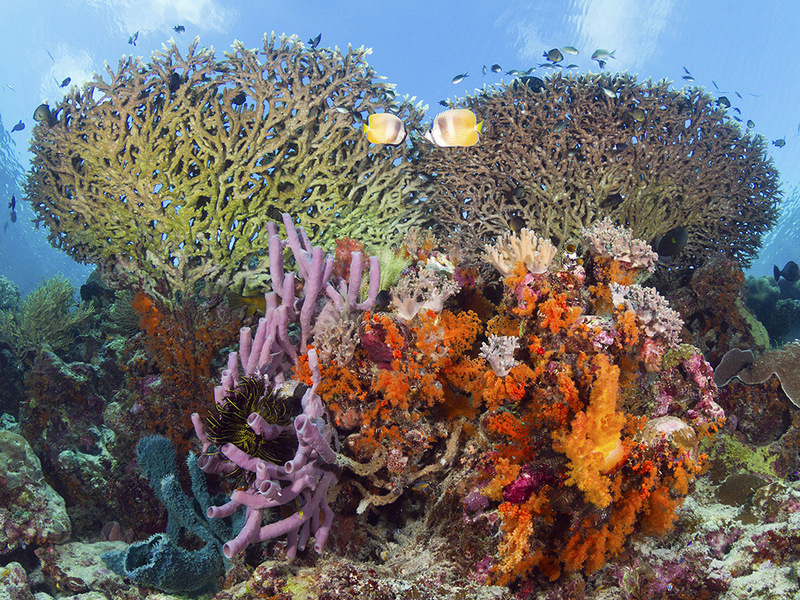 Corals are amongst the most prolific animals on the face of the earth. They have evolved an arsenal of reproductive strategies that allow them to reproduce and survive in good times and in bad. During sexual reproduction, they ‘broadcast spawn’ their eggs and sperm. Huge numbers of gametes are released into the water column to develop in the plankton. The coral larvae may drift for months before finding and settling upon a suitable patch of substrate. Some corals are Gonochoristic, meaning they have separate male and female organs. Some are simultaneous hermaphrodites, meaning they can self-fertilize and produce gamete bundles of eggs and sperm. And asexual reproduction in corals can take the forms of self-cloning or fragmentation. Self-cloning is when a new polyp is formed when a mature polyp splits in two, drops a small branch, or sprouts a new mouth that develops into a peripheral polyp. Fragmentation occurs when stony corals are broken and scattered, with new colonies developing and sprouting up where the pieces land. If juvenile fishes actually manage to survive their larval stage, they are nevertheless still vulnerable and perfect prey for adults. So in order to counteract the high predation threat, the juveniles themselves need to have some good survival strategies. Ready to learn more? 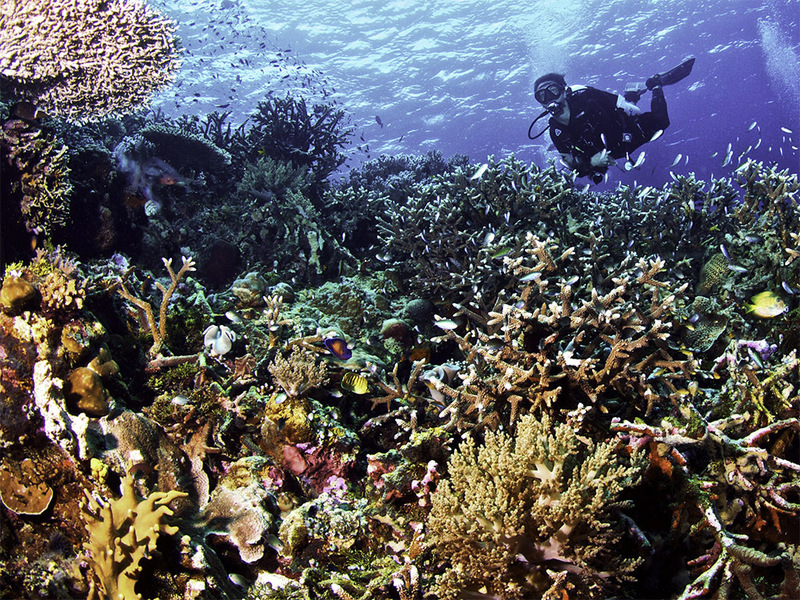 Inquire here about a trip to Wakatobi. Or contact us directly at office@wakatobi.com.